Over the years my iTunes library has been growing substantially, and so has my collection of computers and harddisks. As a result, my personal archive had become quite scattered. Documents, photos, videos, mp3s, it was everywhere! In my quest to archive everything to a big harddisk attached to my Ubuntu server, I came up with the plan to also have a central music server. That would save a lot of space on my laptop harddisk. Plus I would be able to listen to my music wherever I was, in the house or in the world! If you’re a Mac adept like me, you will want to format your kickass external harddisc to Apple’s HFS+ filesystem. To do so, attach it to a Mac, open Applications -> Utilities -> Disk Utility and Erase the Disk using Volume Format HFS (“Mac OS Extended”). I recommend not to use journaling. Although it helps recovering your data in case of a corrupt disk, I found that Ubuntu support for HFS+ Journaled disks is still a bit shaky. Now go attach your external disk to all your computers, move or copy all your mp3s onto it, and attach the disk to your Ubuntu machine. If you installed correctly, the server will prompt you with an authentication window. By default, don’t specify a username and use mt-daapd as password. Go to the Configuration tab and change the default Admin password. It’s probably illegal to open up your music collection online for the whole world to see, so choose a Music password as well. When I was setting things up, I found that I had to fiddle around with file permissions and ownership before the Firefly admin console would see them. Go your router’s admin console and setup a virtual server for port 3689. All incoming traffic on port 3689 should be routed to your Ubuntu machine. iTunes cannot find your shared playlist from another network. 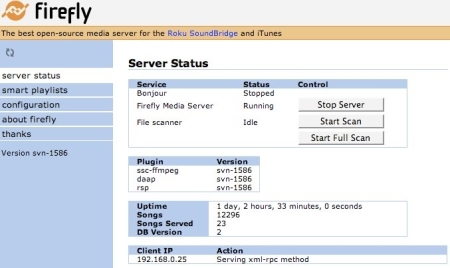 You need to configure a proxy on your client machine that will mimic a shared playlist to iTunes, and connect to your home network on the other side. You can use the rendezvous proxy for this. Get it here or google for it 🙂 Download and mount the .dmg file and run the application contained in it. You should end up with a new icon in the taskbar. Click on it, select Preferences… and then Add Host. 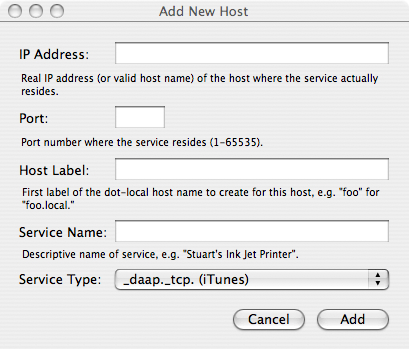 Fill in your home IP address and port 3689, type a dummy host label and a descriptive Service Name, and select Service Type as shown. Scochy on stage - vote for us!